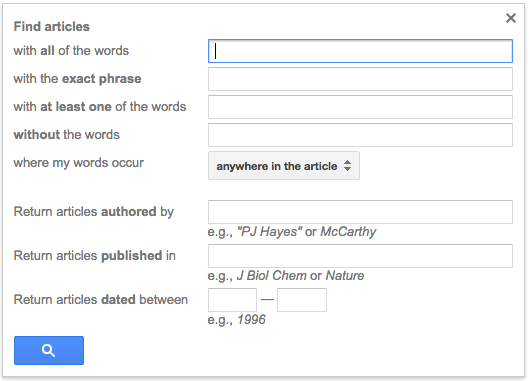 By default, Google Scholar searches for all of your search terms. This is the equivalent of combining each term with AND in our other databases. If you wish to search for phrases (two or more words in a specific order) you need to enclose the phrase in quotation marks. Enter the entire statement: Google Scholar will ignore short connector words (of, on, the, etc.) and search for all of the other words. 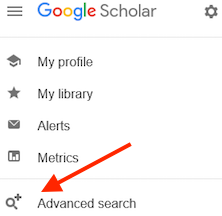 Enter select keywords (sleep deprivation academic achievement college students): Google Scholar will search for all of the entered words. Enter keywords as phrases ("sleep deprivation" "academic achievement" "college students"): Google Scholar will search for all of the phrases. Phrase searching usually provides fewer, but more precise, results. ...and then click on "Advanced Search"